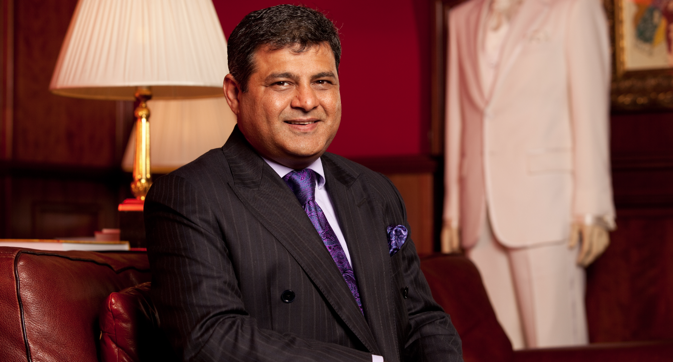 In an exclusive interview, Moscow’s premium tailor and head of the Indian Business Alliance tells RIR that the current economic conditions are creating even more business opportunities in Russia. Indian businessmen in Moscow largely believe that this is the best time to give Indo-Russia trade ties a boost. RIR had a chance to catch up with Sammy Kotwani, President of the Indian Business Alliance, on the sidelines of the India-Russia Business Dialogue Business Forum. As an organizer of this big business event and an experienced businessman, how do you assess Indo-Russian cooperation at the moment? With the number of people who came today it tells us that interest is growing. We always had a good friendship, we all knew it. But now this friendship needs to be converted into business. Some people say that Russia is in a crisis, and because of this there are fewer opportunities now. But I would say the crisis only brings more opportunities for businesses. And the Russian people have already showed interest in doing business with India. Despite strong diplomatic and political ties, bilateral trade turnover is quite low. What, in your opinion, could be the reason for this? India and Russia were never really trade partners. It was more like defence cooperation. But now India becomes closer and there are more chances to build stronger trade cooperation. Indians have not understood Russian market because the Indian market is very big 1.3 billion people and Russian market is ten times smaller. But the area of Russia is so big in size, Indians don’t understand it. Small and medium businesses are suffering from the bureaucratic processes of the Russian government, from immigration law, labour law. Till these things become modernized, there will be no real development. For example, the tax department in Russia has become different. In old times, the tax department used to be known as ‘bad boys who can come to your office and check your documents, maybe even close your company.’ Now this doesn’t happen, they are so organised, they are a service company, they give you service, if you go to them, they will assist you. Labour law has to be reorganized. I am not saying the whole labour law needs to be changed. But it has to be updated. The immigration policies need to be better. If everything is suitable for small and medium industries, India is a good example of thriving small and medium industries. In India, small and medium industry takes care of the whole economy. In Russia, small and medium industry is lacking, it doesn’t exist. In India, small and medium industry means small and medium. In Russia, this word has lost its meaning. Why have there recently been big business deals, like the $400 billion pipeline agreement, concluded between Russia and China, but not Russia and India? There has never been trust between Russia and China. They signed so many agreements. But now Russians understand they made a loss. That was a loss deal. But I don’t know why the Russian government didn’t understand this in the first place. So the problem is not who is signing the deals, but who is benefitting from it. China benefits from this kind of deals. Russia doesn’t benefit from this. And again, we shouldn’t underestimate Chinese dragon. There have never been wars, territorial disputes between Russia and India. So if India is doing business with Russia, it’s not about using Russia for its benefit but for striking mutually beneficial deals. There is one more problem impeding the enhancement of the business cooperation between Russia and India. I always say Russians are still communists, even though they call themselves democrats. They are still living in the bygone era. When they think about India, they still think about the Indian movies, snakes on the roads, cows on the roads etc. They still think in stereotypes. And these stereotypes have to be changed. India today is country with a lot of business opportunities and a growing economy, and Russians can learn from it. Unless there is a desire to learn more about modern, technologically and economically progressing India, there is no success in business cooperation between the countries. And vice versa, Indians should not think stereotypically of Russians. But what is the way to fight those stereotypes? I was telling for a long time that whatever news we get in India about Russia is often distorted. Russia is different. What the Indian readers see is what Bloomberg, Reuters and other Western media report about Russia. Let me tell you we have a very big manpower here. More than 50 percent of India’s population is under 35 years old. So there is a high potential in this enormous manpower, and Russia should think how it can benefit from it. It’s about mutual benefits for Russia and India. Do you think the imposing of the economic sanctions on Russia by the West could push Russia and India closer together? First of all, economic sanctions are joke. They are not real sanctions but more of a political tool of pressure on Russia. It’s more about psychological fever that Russians are going through. Russia has gone through many bad times. There were major economic crises in Russia in 1990s. We remember empty stores and deficit of products. Russia is not going through such times again. The current economic sanctions taught Russia who their friends are because they were on their way to Europe and the USA, and lost touch with India. Now these sanctions open the way for Russia to look beyond Europe and America. But it wasn’t only Russia who used to be West-oriented. It seemed like a two-way process, with India looking the US way too during the previous Manmohan Singh government? India has 1.3 billion people. No one can satisfy 100 percent demands of such a big country, so we can have some share of it. So it doesn’t make a difference where they look or where they don’t look. We should not think about a small share of business but rather of business on the whole.